Make yourself at home in one of the 35 individually furnished guestrooms, featuring refrigerators and microwaves. Complimentary wireless Internet access keeps you connected, and cable programming is available for your entertainment. Bathrooms have showers and hair dryers. Conveniences include ceiling fans, and housekeeping is provided daily. Grab a bite at Breezer's Tiki Bar, one of the hotel's 3 restaurants, or stay in and take advantage of the room service (during limited hours). Relax with your favorite drink at the bar/lounge or the poolside bar. Buffet breakfasts are available daily from 7 AM to 11 AM for a fee. 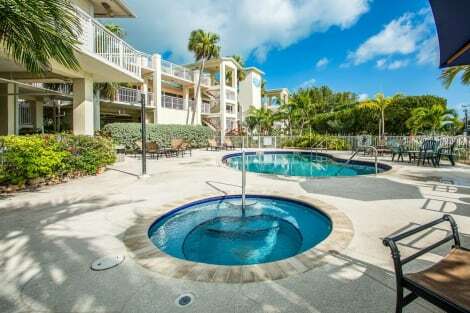 Key Largo Hotel's Guests Steps From Marina Adventures Ideally situated next to Key Largo Resorts Marina, this hotel's location places patrons in the perfect position to take advantage of endless Florida Keys fun! Those seeking hotels in Key Largo for that relaxing tropical vacation or corporate retreat find the Holiday Inn® Key Largo hotel to be just what they're looking for. From days spent oceanside beneath the Florida sun to snorkeling and scuba diving adventures to romantic sunset cruises, Key Largo recreation is what vacation fantasies are made of. Take the family to John Pennekamp Coral Reef State Park to see the 30,000-gallon aquarium or get even closer to marine life by swimming with the dolphins at Dolphin Plus. A 55-minute drive south from the bustle of Miami, this resort's event facilities offer a quiet, relaxed atmosphere that is ideal for sales meetings and corporate gatherings. Gain a new perspective on your business plan as you convene in one of five function rooms, or celebrate successes in the 2,000-sq-ft Tiki Hut Pavilion. A 24-hour Business Center offers more support, and free wired and Wi-Fi access is provided throughout the property. Complete with every perk from on-site dining and a poolside Tiki Bar to two heated, outdoor pools and a 24-hour Fitness Center, this Florida Keys hotel's accommodations in Key Largo ensure a memorable travel experience. It's an island paradise from the moment you arrive. Book today! When you stay at Hampton Inn Key Largo Manatee Bay in Key Largo, you'll be near the bay, within a 15-minute walk of John Pennekamp Coral Reef State Park and Dolphins Plus Bayside. This beach hotel is 0.8 mi (1.3 km) from Lower Sound Point and 1.3 mi (2.1 km) from Dolphin Cove. Take advantage of recreation opportunities such as an outdoor pool, or other amenities including complimentary wireless Internet access and gift shops/newsstands. Additional features at this hotel include wedding services, a picnic area, and barbecue grills. 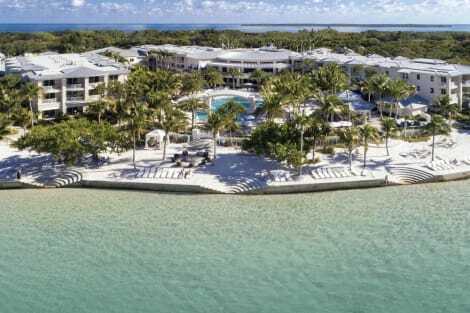 With a stay at Baker's Cay Resort Key Largo, Curio Collection by Hilton in Key Largo, you'll be on the waterfront, within a 15-minute drive of John Pennekamp Coral Reef State Park and Bluefin Rock Harbor Marina. This beach resort is 12.1 mi (19.5 km) from Theater of the Sea and 3.1 mi (5 km) from Laura Quinn Wild Bird Sanctuary. Pamper yourself with a visit to the spa, which offers massages and facials. If you're looking for recreational opportunities, you'll find an outdoor pool, a spa tub, and an outdoor tennis court. Additional features at this resort include complimentary wireless Internet access, concierge services, and gift shops/newsstands. lastminute.com has a fantastic range of hotels in Key Largo, with everything from cheap hotels to luxurious five star accommodation available. We like to live up to our last minute name so remember you can book any one of our excellent Key Largo hotels up until midnight and stay the same night.